The Olympics are known for national pride, rigorous competition, and lots of athlete-on-athlete sexytime. After all, these are young people at the peak of their physical prowess surrounded by other world-class competitors – of course they’re going to go for a few belt notches as they go for the gold. They’re even using the dating app Tinder to find hookups in the Olympic Village. If I was running the American team, I’d encourage my athletes to get in there and be reckless – it’s our chance to breed the super athletes of the future. The offspring of Norway’s Ola Vigen Hattestad and our beloved Jamie Anderson would be unbeatable on slippery surfaces of all types in the 2034 games. USA-USA-USA! Of course, a lot goes into choosing a prospective mate – there’s animal magnetism, personality traits, and now, thanks to those clever Canadians, FREE BEER! This should make the choice of which house to cruise in the Olympic village a little easier for beer-loving athletes from around the world. 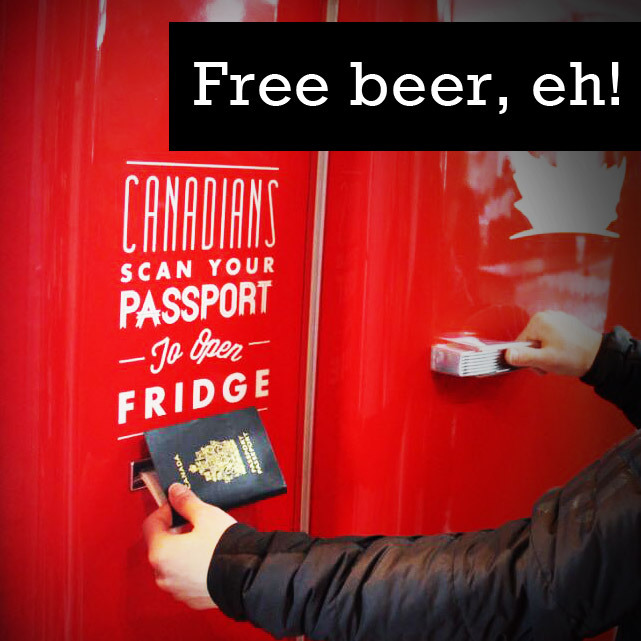 Judging by the logo on its door, it appears the free fridge is the brainchild of the folks at Molson, so it’s probably full of their products. While some beer snobs might sneer at this, I’ve enjoyed many a Molson Brador purchased when crossing the border. Plus it’s free, and Canada sent a bunch of good looking and talented athletes to this year’s games. I say we send the American team over there right away for a few beers, a little chit chat, and whole lot of Gold in 2034! ← Beer Poll: Is Serving Beer at Movie Theaters a Good Thing or a Bad Idea? Especially if you have access to a Canadian passport! Well, Canada already has 10 medals – 4 of which are gold – and it’s only Day 5…so does that mean Molson is the new Gatorade? Drink/breakfast of champions?? I think you might be on to something there, although I haven’t won any medals (yet!) and I drink plenty of beer! At any rate, i love the idea of Olympic-sized beer muscles!! Have to hand it to the erstwhile morons at MillerCoors. This is a MUCH better idea than Miller Fortune, er, (eh)… Zima Gold. Anyone feel like lending me their passport? Oh, and a ticket to the games.